Well July has come and gone, and she of course brought with her another Baby Bundle! It is so nice to know that you have guaranteed fluffy mail coming your way every month, and it is even more fun that it is a surprise! This month Sarah and her creative team have given another amazing exclusive to her loyal subscribers, this time they have brought us a perfectly timed lanyard! 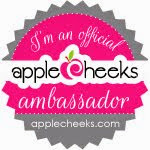 I picture how perfect these would be for a teacher returning to the classroom, what a nice way to bring a little Peace Love AppleCheeks to the workplace! Similarly they would be super handy for nurses, business people, key holders, there are tons of jobs out there that require a lanyard, and why not have it be such a cute one, which reminds you of such awesome people. 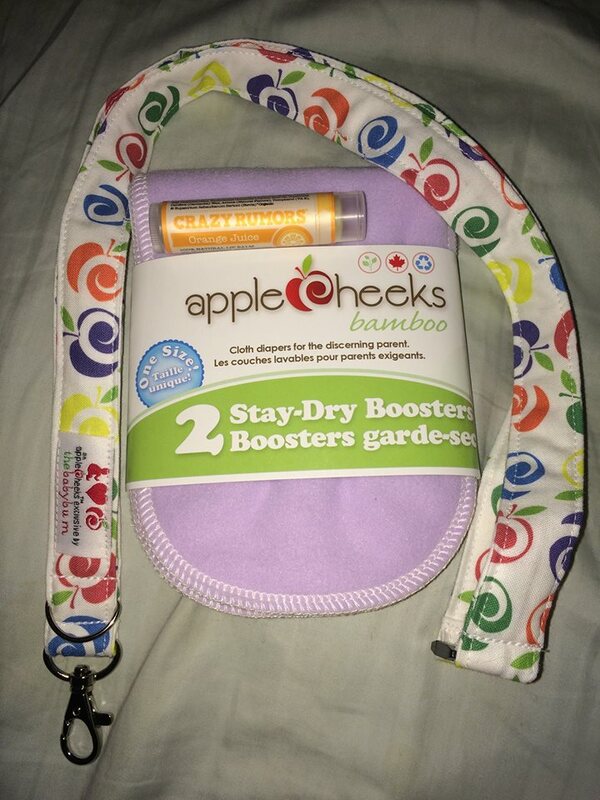 Others have suggested it is a great way to keep track of your keys in that ever consuming baby bag or you can use it to display both your nametag and AppleCheeks obsession all at once! I have not yet come up with a good way to wear mine, so I am leaving it enshrined until I can do it justice. She also included this Crazy Rumours Orange Juice lip balm. The smell is absolutely insanely yummy, just like a creamsicle, but sadly the taste is a little underwhelming, so I am just going to sit here and smell my lips. I think it is pretty cool, but William is totally obsessed, he just wants to steal it from me and chew on the (capped) tube, Dude! Unsafe toy! 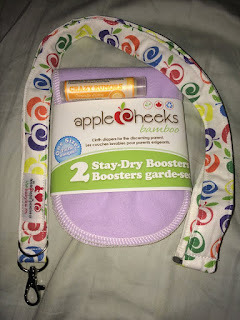 Last but never least, I got another set of stay-dry AppleCheeks boosters. 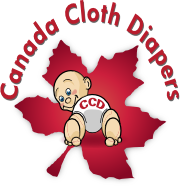 They work great as part of our nighttime stuffing solution for William, or as just a wee bit more absorbency if you need to get just a little more time out of your diaper. I am super pumped about the upcoming August bundle. Most of you probably know that The Baby Bum recently released their gorgeous exclusive Serendipity diaper! I am excited to see if I get a sac or a cover in this amazing new colour!